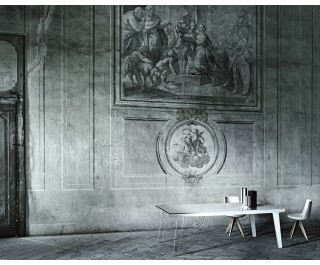 Monolithic table in transparent extralight glass with tempered top mm. 12 thick, and shaped feet mm. 19 thick. The feet and the top are glued together thanks to a special inclined grinding of the glass. One side of the table presents a white finish which gradually fades until it vanishes and becomes completely transparent at the other side. This sophisticated manufacturing process imparts a magical effect of evanescence to the piece. Available completely in transparent extralight glass too.